Hello! It is hard to believe that Mother's Day is almost here. 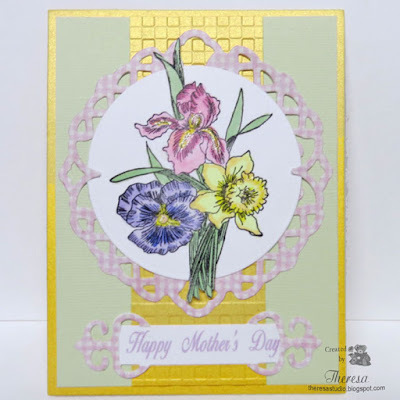 I decided to make this card for my Mother using Repeat Impressions Spring Blossoms stamp and the sketch challenge from their blog. I stamped with Memento Tuxedo ink and colored with Copics and added some shine with Stardust pen and a yellow Glitter Dome for bling. I used Spellbinders circle die, a label die, and a pendant die. Papers are Mint Green CS, Crafter's Shimmering Yellow Pearl CS, and ODB Shabby Rose Pattern Paper. 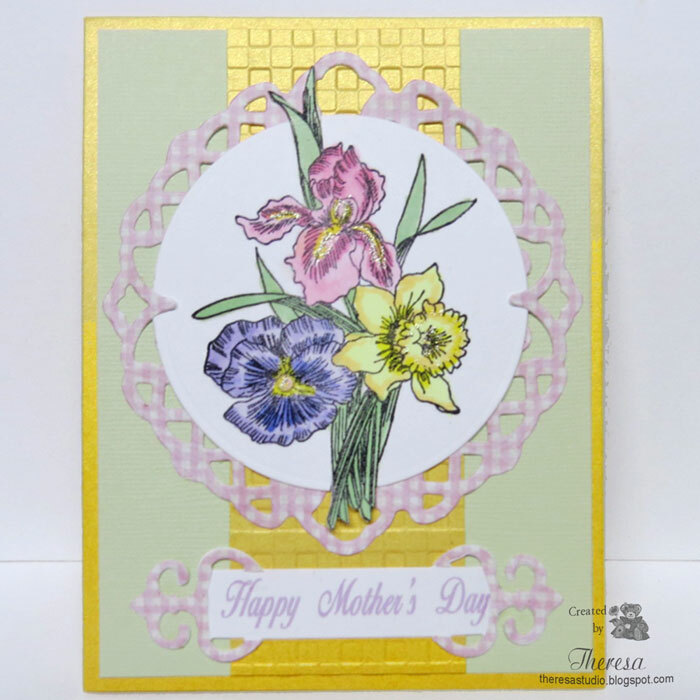 I hope you can see the beautiful shimmer of the Yellow CS that I decided to use also as the card base. 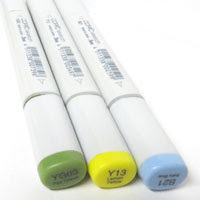 I use Gingham EF on the center strip of yellow. The sentiment was printed on the computer with Cotillion Font. 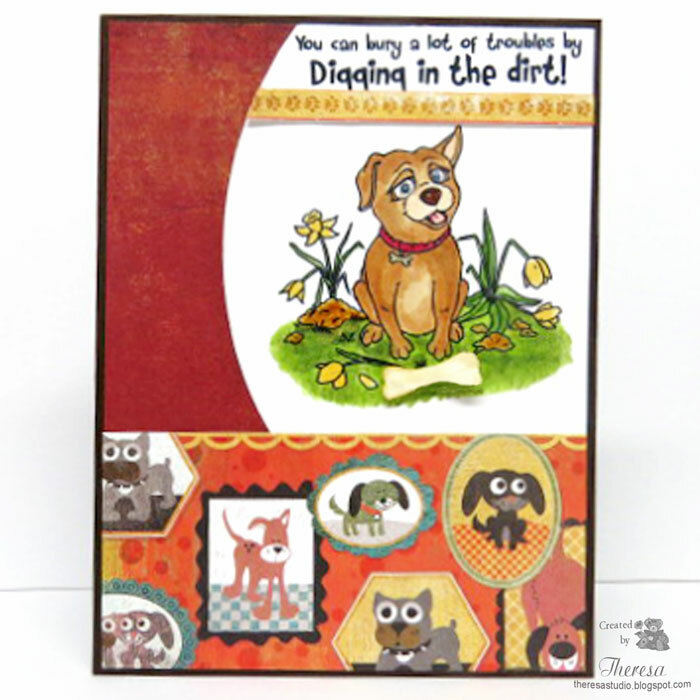 Die Cuttin Divas: Challenge April Symbols - Flowers/ Bling. Used flowers and some bling with Circle die, Pendant die, and Label die. Hello! 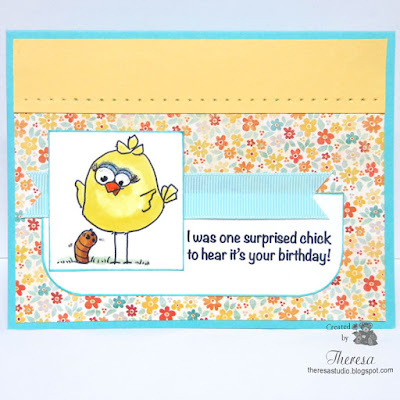 Cartoon style birds seem to be a trend in card making and I decided to use this one by From the Heart in my card using one of their Sketch Challenges. I colored the image with Copics and dressed up her eyes with Stardust pens. I combined MME Pattern Paper, Turquoise Card Base, a Perforated Yellow CS Strip, some Ribbon, and a From the Heart Digital Sentiment to complete my design. 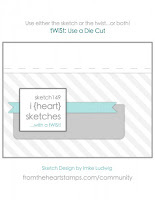 From the Heart: Sketch Challenge #149 with a twist use a die cut. I used a Nestabilities square die to cut out the image and cut the ends of my ribbon with the corner of a die cut. 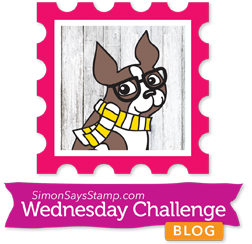 Simon Wednesday Challenge: Simon says anything goes. 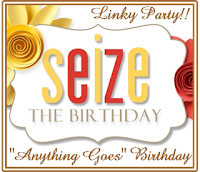 Cards in Envy: Another year older Birthday Card. 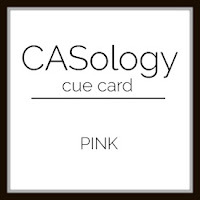 Card is flat enough to fit in to an envelope. 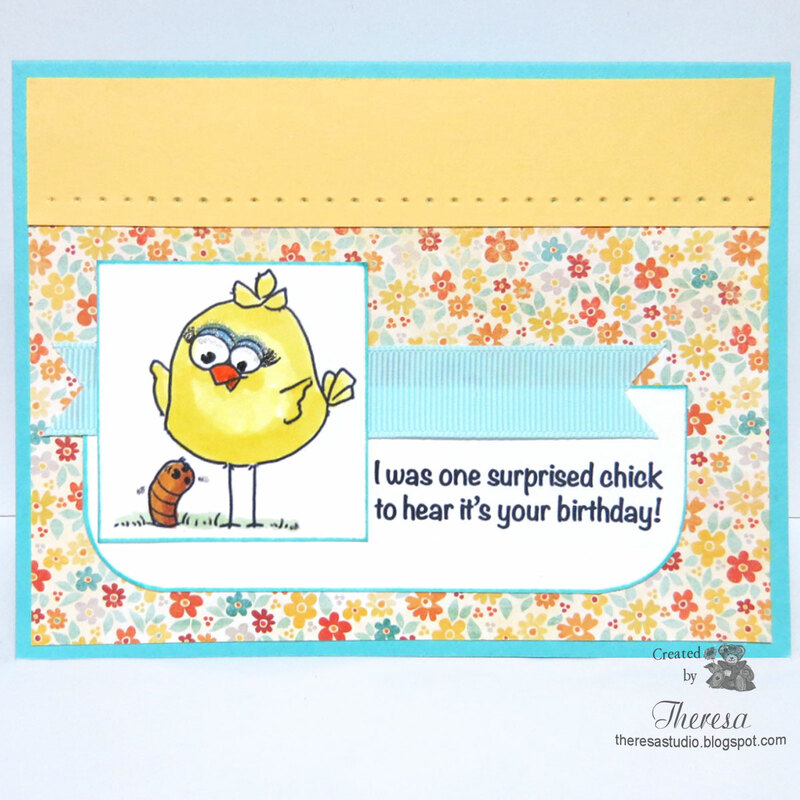 Crafty Sentiments Design: Challenge theme is Birthday. Hello! I made this card using some of my older masculine stamps with a bit of trash...metal trash that is, to enter into some challenges with a sketch, colors, and use of metal request. I pulled out a GKD stamp set Life is Good that I have had since 2010 and stamped the Train on White CS with Memento Tuxedo Black ink and colored with Copics. 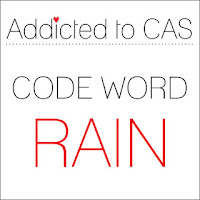 I added a sentiment from the same set. I attached this to a Dark Gray card base and then added striped DCWV pattern paper with my embellishment made with Orange seam binding tape and metal tabs from soda cans. I thought metal tabs went well with the metal feel of the locomotive. Retro Rubber: Challenge 37 Feeling Sketchy. The copyright of this stamp is 2009 and I have had since at least 2010. See sketch below. 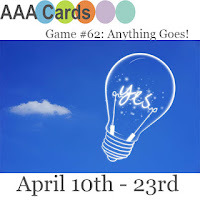 613 Avenue Create Challenge: Anything Goes with Optional Twist-Orange and Blue plus 2 Neutral Colors. I have Orange and Blue with browns and grays. 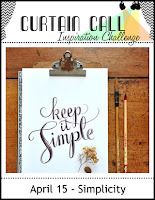 Always Playing With Paper Challenge: #70 Masculine Photo Inspiration. I was inspired by the grays and the feel of metal and transportation in the photo. Hi! 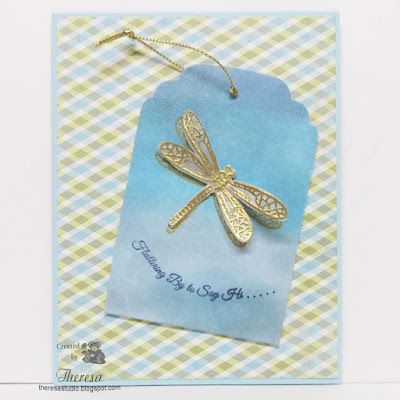 Today I am sharing a card with a tag and dragonfly theme. I cut the tag using a Spellbinder Die but trimmed it to make it the shape that I wanted. 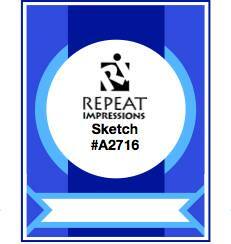 I inked the tag with Distress Ink Stormy Sky, Broken China and SU Bordering Blue. 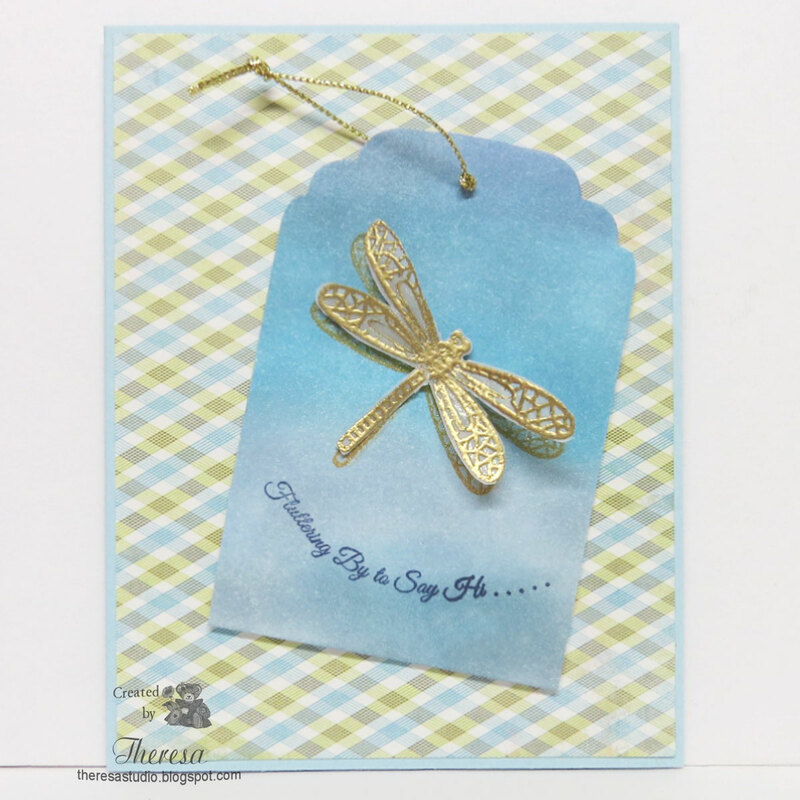 I then stamped the Dragonfly on to the tag and then attached a Dragonfly stamped on Vellum with Versamark and heat embossed with Gold EP. This was cut with a die....stamp and die are from a set by Creative Die. The Papers and Such sentiment was stamped with SU Night of Navy ink. I finished with a card base of Turquoise CS and a layer of MME Pattern Paper. I loved when I found the perfect paper to go with the tag. I usually start with the paper first as color inspiration but I kind of worked backward here. 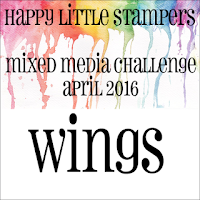 Happy Little Stampers: April Mixed Media Challenge-Wings. Butterfly Challenge: #53 Butterfly plus T for Texture and/or Teal. My butterfly (dragonfly that is) has texture. I think there is what might be considered teal or close to it. Hello! I found this verse at Silhouette and printed it out to make this card for Mother's Day. I simply cut the words out using a Spellbinders Die, inked the edges and some of the words with Memento Grape Jelly marker, and attached the cut out to a lavender card base that I dry embossed with Spellbinders Devine Eloquence die. very simple and quick. Hello! 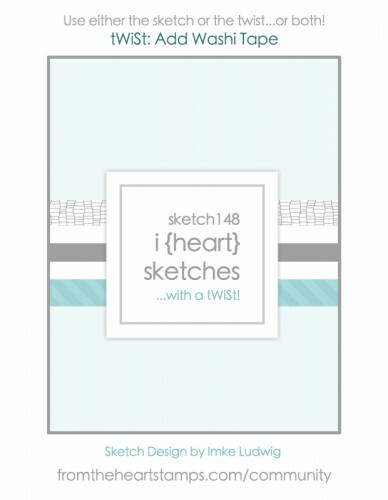 I have again been playing with From the Heart stamps and Washi tape for the I (heart) Sketches with a Twist #148 sketch challenge. See below. The twist is to add Washi tape. I am using digital stamps from Time to Bloom that I received to use in this Stamp of the Month challenge at From the Heart. I colored the floral images with Copics and sponged the background with Memento Pink ink. I added some Dewdrops for interest. I layered this with Red CS and placed on an Embossed (EF Swiss Dots) card base striped with MME Washi Tapes. Hello! 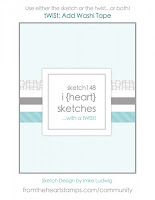 I have been playing with From the Heart Digi stamps and Washi tape for the I (heart) Sketches with a Twist #148 sketch challenge. 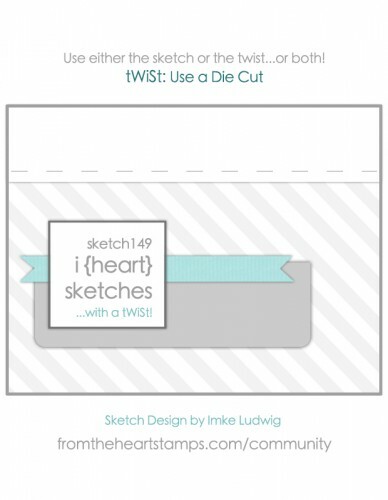 The twist is to add Washi tape. The Surprised Birdbrain and Sentiment were printed and colored with Copics and a bit of Blue Glitter Gelly pen on the eyes. Instead of matting the image, I wrapped some of the GKD Washi tape around the edges that I also used on the card. I happened, just by accident, to find a MME pattern paper that I thought coordinated well with the tape and the colors that I used. Arranged this on a Grass Green Card Base. I was pleased at how this card came together. 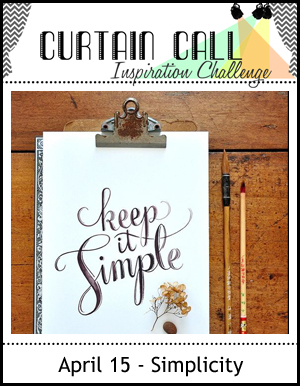 Curtain Call Inspiration Challenge: Simplicity- Keep It Simple. Hello! The spring daffodils have been beautiful and are about finished blooming but they live on in my stamp from Repeat Impressions. I stamped it on White CS with Memento Espresso Truffle ink and colored with Copics. I placed this on a mat of handmade design paper leftover from another project (using wax paper embossed technique) and a Green CS layer embossed with EF Gingham. The edge of the Yellow Card base was also embossed with a Border EF but it is hard to see. I trimmed the edge of the card and attached a strip of the Green CS to the inside. The vertical sentiment from Repeat Impressions was stamped with SU Always Artichoke ink. The House That Stamps Built: WIW Photo Inspiration Challenge A2016, Shown on right. Cards in Envy: Another Year Older Card Challenge. My birthday card fits into A2 Envelope. 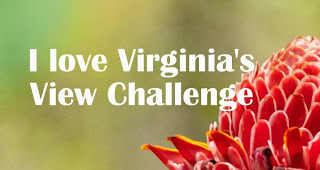 Clear It Out Challenge: Theme is Nature-birds, flowers, etc. Stash: Greenery-leaves, papers. etc. Hello! 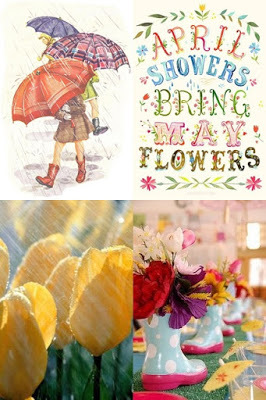 We are expecting April Showers later today so I decided to make a card using Wags 'n Whiskers Love You Sis stamp with a rain theme. I only used the upper portion of the stamp featuring the umbrella. 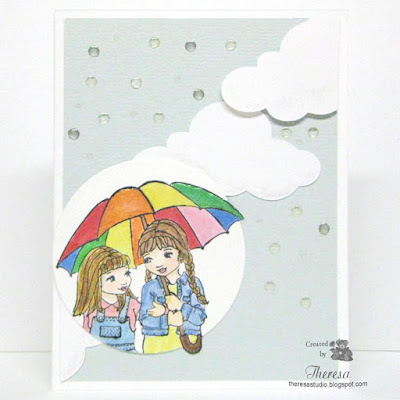 After stamping in Memento Tuxedo Black I colored the image with Copics and added some Glossy Accents to the umbrella. 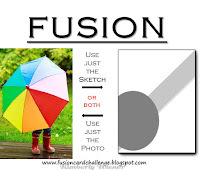 I pulled my colors and layout from the Fusion challenge shown below. My clouds were cut on the Cameo with a Silhouette file and I used a Spellbinders Circle die for the image. I used a "cloudy" blue CS for the background and white CS for the base. 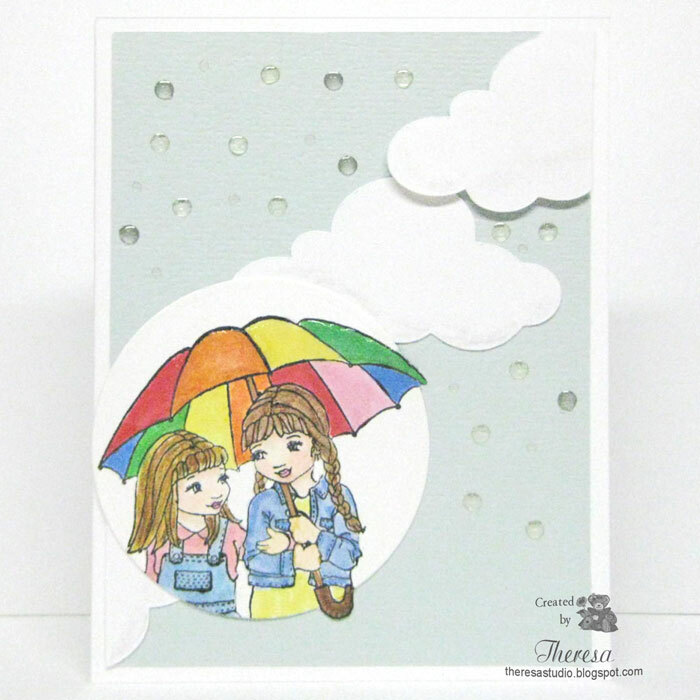 The Raindrops are Cloud9 Design Rain Dots. 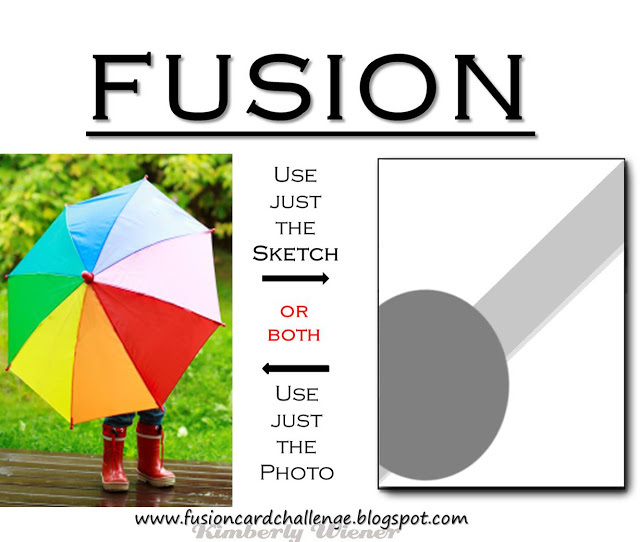 Fusion Card Challenge: April Showers. I used both the photo and sketch. Retro Rubber Challenge: #36 April Showers. I know this stamp goes back to about 2010. 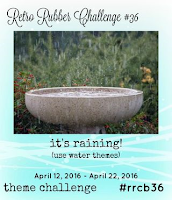 Mod Squad Challenge: Water, water everywhere! I have raindrops on my card. Hello! Are you celebrating beautiful weather? 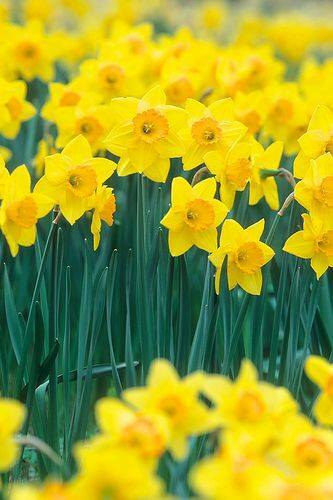 Here in Ohio the past few days have been glorious...something to celebrate after winter over stayed its time. I made this card for a celebration using From the Heart's stamp of the month Time to Bloom. I used a sketch from Tuesday Morning Sketches for my design. Supplies used: Copics including Gold for the watch, Stardust Pen, White and Pink CS, MME Patterned Paper, Spellbinder die, Pink Satin Ribbon, Pearl colored with Gold Copic (center of Watch), Flourishes stamp for sentiment, SU Pink ink. 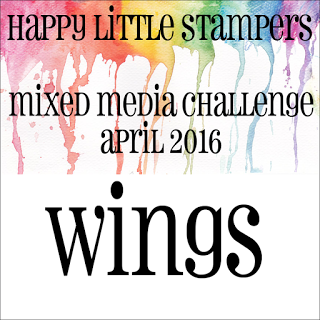 From The Heart: Digital stamp of the month April Challenge. Check out the details to find how you can receive free stamps. The Ribbon Girl: April challenge is anything goes as long as you use any image. Welcome! 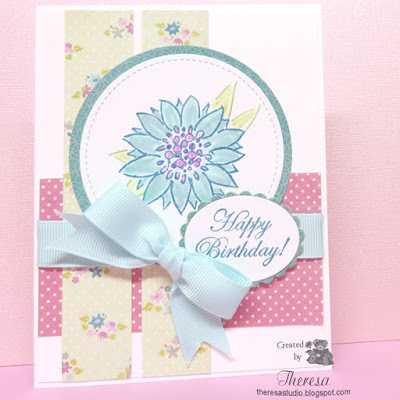 I was inspired to use flowers for this card that I made with Cheery Lynn Build a Flower dies by the beautiful spring flowers that we are enjoying. I used a negative from Cheery Lynn Fanciful Flourish die that I had as a leftover and layered it with some background paper that I made with a wax paper embossing technique. I used a double layer of the word Thanks also cut with Cheery Lynn die. Supplies: Cheery Lynn dies, Green and Yellow CS, Green Brads, Darice EF, Background made with White CS, Wax Paper and Green inks. 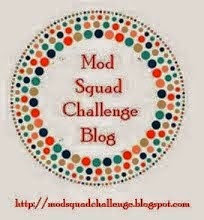 Mod Squad Challenge: Make a Negative a Positive. I made the flourish negative a positive. Hello! I am anxious to get outside because our weather is so beautiful! I too want to go dig in the dirt. So this will be a very quick post. 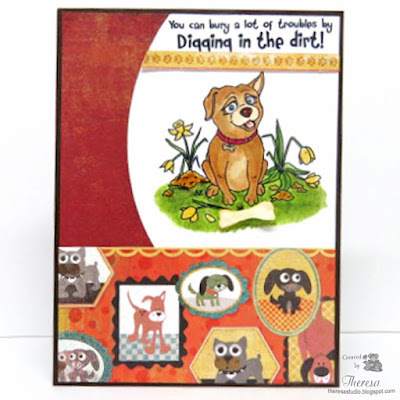 I missed the sketch challenge deadline at From the Heart but this card qualifies for the challenge at The House Stamps built which is Who Let the Dogs Out? Hello! 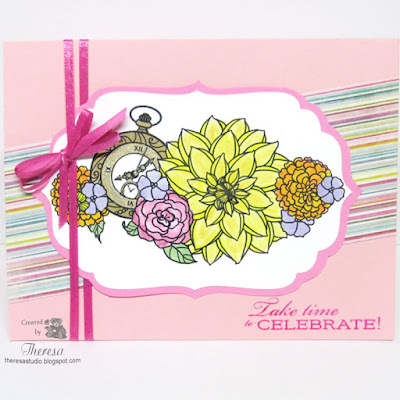 Today I am sharing a card that I made for the Stamp TV Release Party challenge using GKD Stamps from Buds & Vases. The challenge is The Great Divide-we are to divide a panel on a card into separate pieces. I used a similar layout to Gina's card shown on the Release Party video. Supplies: Stamps GKD, Memento Tuxedo Black Ink, SU Always Artichoke, White CS, GKD Grass Green CS, MME Pattern Papers, Copics, Yellow Glaze Pen. Hello! I have been taking a break from blogging to do some other projects as well as some outdoor work since our weather has been spring like the last few days. I took time out to make this card using a wax-paper embossed background technique seen on Stamp TV in this video. 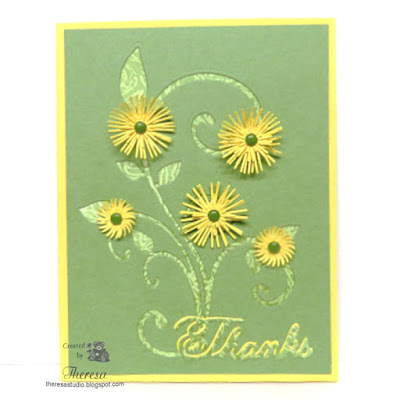 I assembled the card with my background, a layer of white using a corner punch on the corners, a fussy cut flower, a die cut flourish, green card base, and the sentiment heat embossed on Vellum. Supplies: Stamps- GKD A Year of Flower 2 and The Northwoods (Sentiment), Memento Rose Bud ink, SU Regal Rose ink, Versamark, White EP, GKD Grass Green CS, White CS, Vellum, EK Success Corner punch, Cheery Lynn Flourish Die, Darice EF Floral Frenzy, White Pen, White Pencil, Wax Paper. Cards in Envy: Challenge is Flowers and/or Fantasy. Card is A2 size and fits into an envelope. 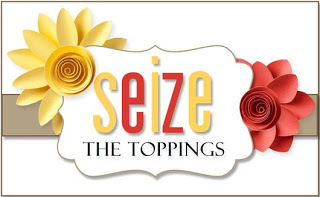 Seize The Birthday: Toppings is Floral. Hope you are enjoying beautiful weather! Hello! 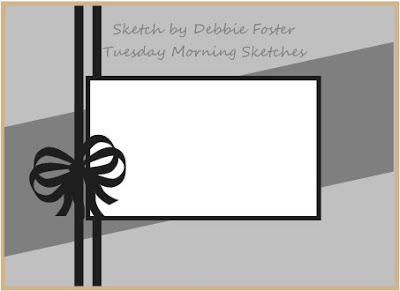 Today I am sharing a card that was inspired by Pattern Paper in MME Collectable pad using a sketch from Stamp TV challenge. 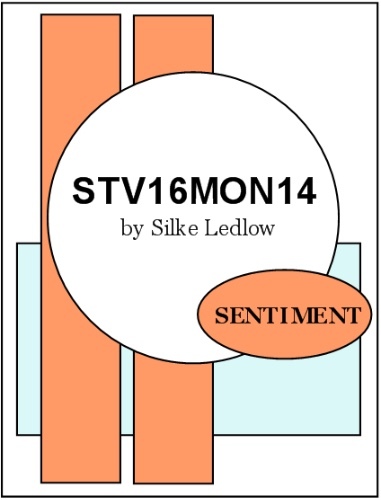 I selected 3 of the papers and pulled colors to use on my image and sentiment from the floral pattern. 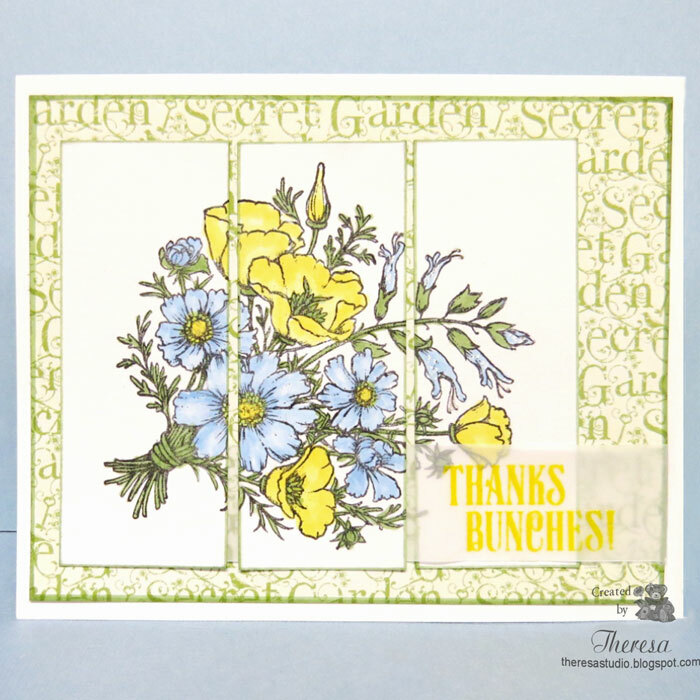 The floral stamp is from GKD A Year of Flowers 2 and the sentiment was from a GKD prize grab bag. Other supplies: White CS, Memento Teal Zeal and Pistachio inks, Copics, Pink Glaze Pen, Circle and Oval Dies, Grosgrain Ribbon from stash. 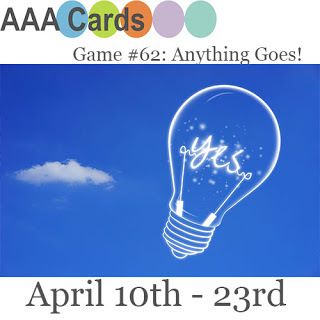 House of Cards: April challenge use script and/or color challenge. 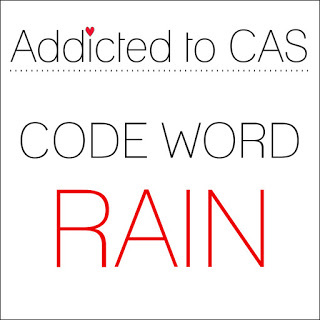 I used sentiment script. I am sharing a Card that I made "casing" another card designer for a challenge at Happy Little Stampers. 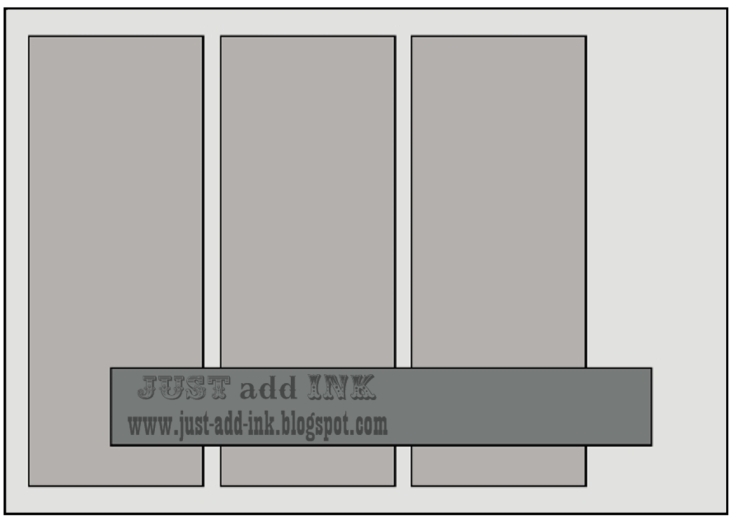 I stamped Power Poppy Poppies stamps and sentiment with Memento Tuxedo Black on white CS. Using a Rectangle die, I cut a section from the stamped area and colored this area with Copics R29,YR07, Y06, YG95,YG63. I attached the center to foam cut the same size and attached both stamped sections to the card base of Yellow CS. 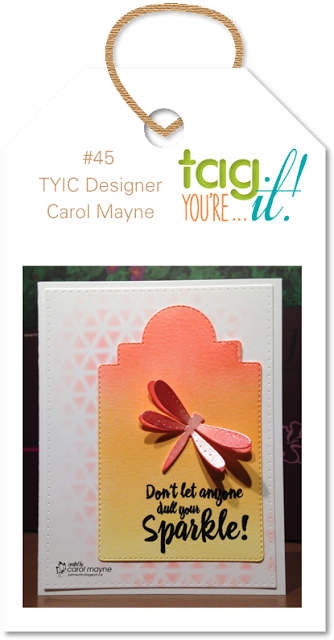 I pretty much followed the layout of Joyce's card but used different stamps and colors. I like using the foam to keep the card from being crushed in during mailing. 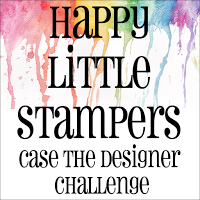 Happy Little Stampers: Challenge-April CASE the Designer Joyce Mehrberg. 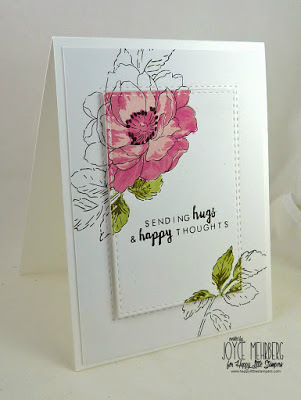 My favorite cards to make are those that feature flowers, especially with stamps by Marcella Hawley of Power Poppy and also with stamps she designed for Flourishes. 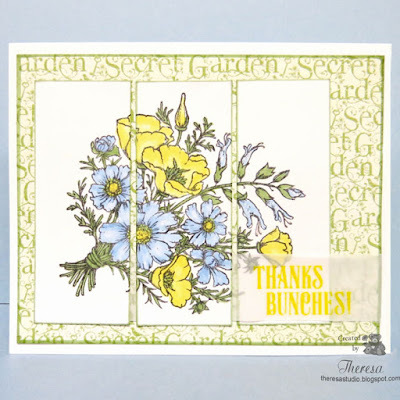 I love this stamp from Countryside Bouquet Deluxe that I inked with Memento Tuxedo Black ink and colored using only 3 Copic markers-B21, Y13, and YG63. I cut the image into 3 panels and created the card with a base of White CS and a layer of Graphics 45 pattern from Secret Garden pad. 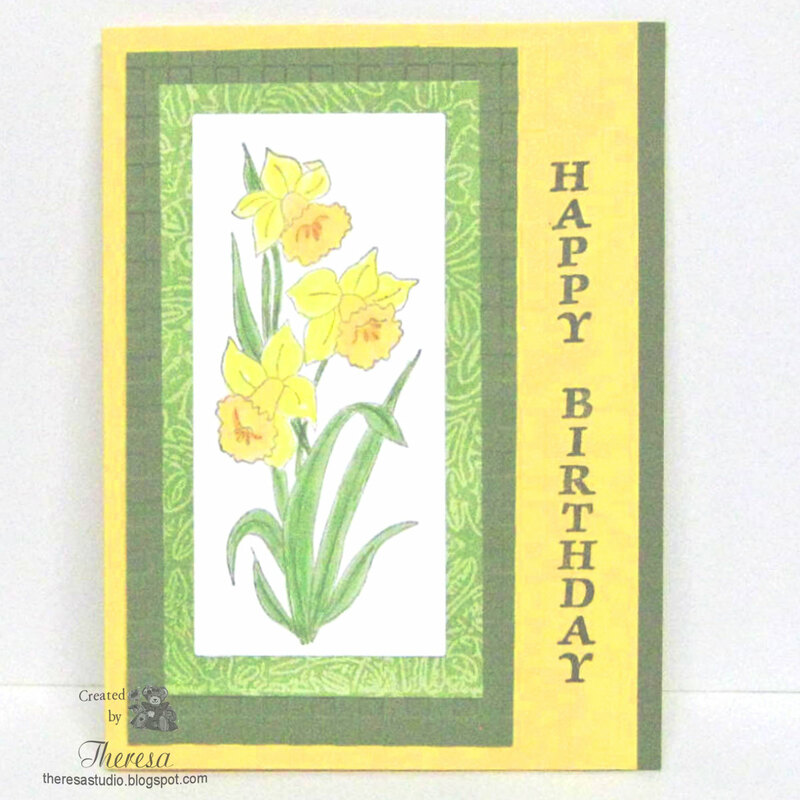 I finished with a Power Poppy Sentiment stamped on Clear Vellum with Versamark and embossed with WOW Yellow EP. Copic YG63 was used to edge the panels and pattern layer...gives the look of layers but without additional papers and weight. 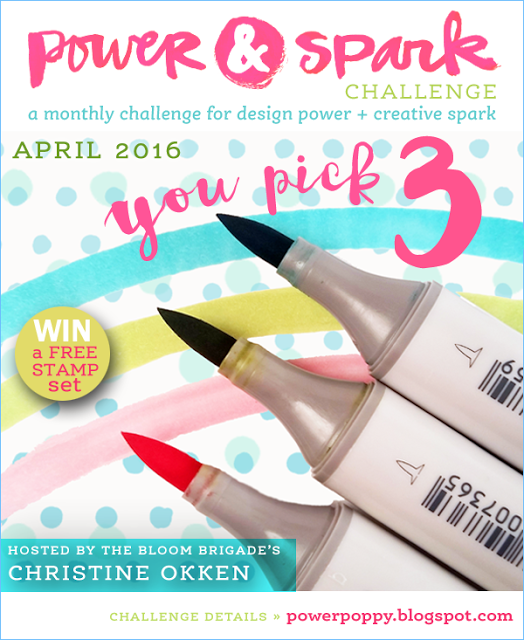 Power Poppy Power & Spark Challenge: You Pick 3 -Create something using only 3 markers. See link for complete details. I used Blue (B21), Yellow (Y13), Green (YG63) from complementary Color families. Not as easy as it may sound. 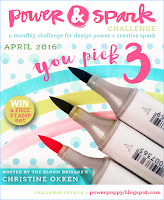 Addicted to Stamps and More: Challenge #187 Make Your Mark-used Copics. Cards in Envy: Flowers and/or Fantasy. Used flowers on my card that fits into a regular envelope.